When our Filipino hero fought Ricky Hatton last May 2, I penned an article that morning entitled, “MP’s secret is spelled MP.” In that piece, I elaborated saying that MP’s success formula—apart from his speed and muscle—is his mental backbone. Mind Power. That’s MP’s MP. I likened his psychological tenacity to Tiger Woods’ and Rafael Nadal’s. Today, I’m revealing another secret. Actually, it’s no mystery. It’s obvious. Only, I’ve noticed it lately. Manny’s smile. Yep. That’s it. That’s MP’s oracle. That’s the bayonet he holds to obliterate the enemy. His smile. Think about it. 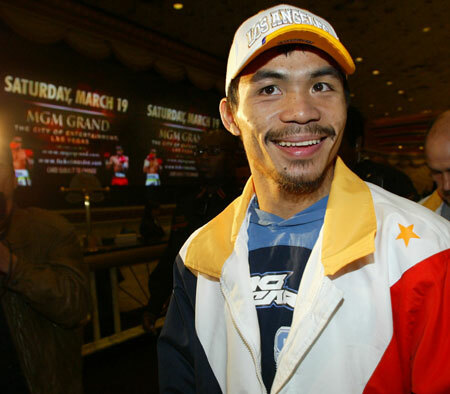 Doesn’t Manny smile more than the usual athlete… than the usual boxer? Because, if we stereotype boxers, aren’t they supposed to frown, smirk, pierce angrily and look treacherous? All the time? Aren’t boxers supposed to look scary? Intimidating? And not smile? Yes. But Manny smiles. Unlike many. And Manny wins. Unlike many. So here’s the secret we all know about our prized Filipino possession: He looks happy. On his face is a grin—not a growl. He’s cheerful and merry. Unlike most “tough guys” who look ugly with their perennial frowns. Haven’t you noticed that in most boxing fights, when the pugilist enters the Las Vegas arena, he looks grim, serious and, to borrow, the Lady Gaga song, “Poker face?” Wanting to look nasty, didn’t we witness Oscar de la Hoya entering the boisterous stadium never-smiling? Didn’t we see this in Ricky Hatton? And don’t we observe this I’m-tough-therefore-I-have-to-look-mean look? Not MP. With Manny, entering the MGM Grand stadium, he’s like a child—with dad and mom on both sides, with his relatives behind him—about to enter Disneyland! He’s eager. He’s bouncing. He’s energetic. He’s smiling. Right? MP is right. Smiling helps. Smiling is the outward sign of inner confidence. It’s a sign of feeling positive. A smile confuses an approaching frown. No wonder MP’s opponents, frowning while approaching the boxing ring, always lose. Maybe it’s also because it takes only 17 muscles to smile and 43 to frown—that this proven statistic helps Manny weaken his gloomy-looking opponents. Take the Jimmy Kimmel Live show in Hollywood, of which MP was a guest a few days ago. Did you watch it? If not, you should—go to YouTube. Throughout his 11-minute interview and song number (“Sometimes when we touch”), Manny is jumping on his chair, beaming a toothful cheer. MP smiles. How about MP’s enemy? “Miguel Cotto’s own media day, which took place Tuesday at the Pound4Pound Gym here in Los Angeles, paled in comparison,” wrote Cordero. “For one, it looked like Cotto left his smile in his training camp in Las Vegas. 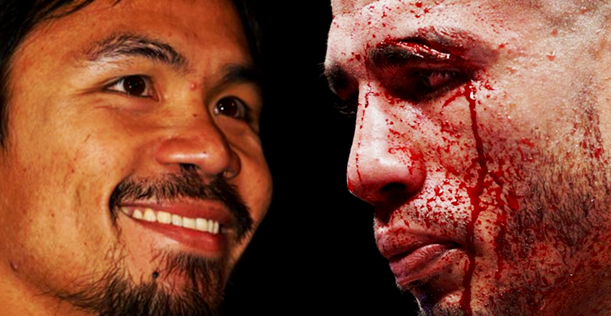 Miguel hardly smiled at the gym yesterday and here he was looking so happy, Pacquiao was told. “’Ganoon ba? Pag-bigyan niyo na. Nagre-reduce yun eh (Is that so? Let him be. He’s reducing),’ said the 30-year-old icon who looked so comfortable he can tip the scales anytime and make limit of 145 lb. Manny Pacquiao is not the world’s typical boxer. In the ring or outside the ring, he displays genuine humility. He does not make rude forecasts like Mayweather Sr. did. Manny smiles because he is having fun while boxing. Unlike Oscar who fights for money, Manny fights for fun.